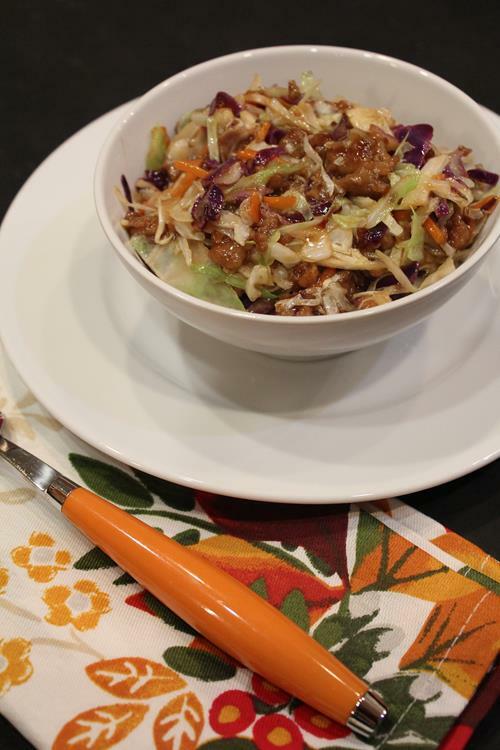 Easy Cabbage Stir Fry is an easy and delicious lunch or dinner! Do you need a quick, easy, and a little healthier meal to start the new year? This is the perfect recipe! When I made this last month for the first time I knew it would be a great recipe to share this month. So many people are starting off the new year with the goal of eating healthier and this recipe is great for that. But even if your goal is not to get healthier or lose weight this year, I think we can all use some healthy eating after all the holiday food we have been eating. 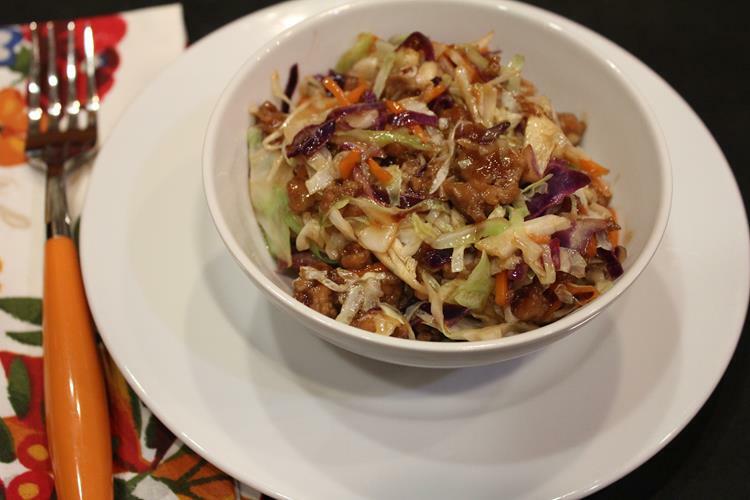 I love simple meals like this cabbage stir fry. It is so easy to make. It goes together in no time at all. This recipe is based on a recipe I made several years ago and used as a wrap. I think we enjoyed it better this way. 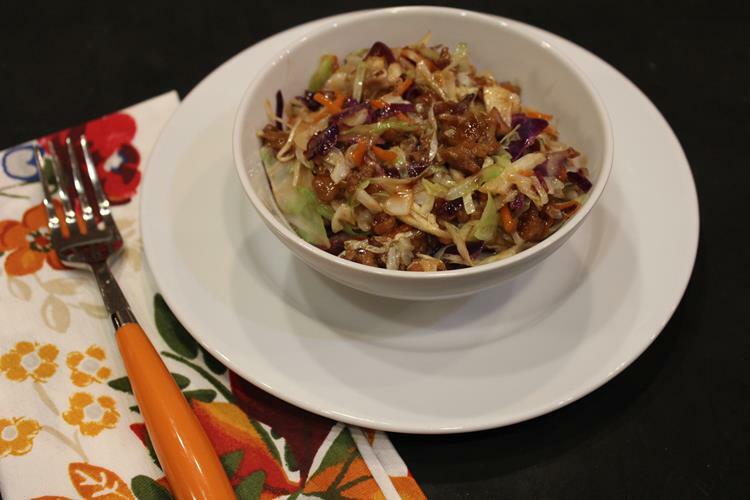 My husband and I loved this cabbage stir fry. So did one of my daughters. My husband loved the leftovers in his lunch the next day. This is what I shared though on Facebook the night I made it. Some days you make a dinner that the whole family loves. Others days you make a dinner that your husband and you loved, but two out of three kids wish you hadn’t made it and hope you never make it again….. I hope your kids enjoyed dinner better than mine. Just keeping it real for you. What was for dinner at your house? Just to keep it real I will totally admit that two of my kids did not like this. Not at all. They ate it, because they eat what is served them, but they did not like it. This recipe is great with ground pork and that is what I usually use since we raise hogs and I have a freezer full of pork. Ground chicken or ground turkey would work just as well. It is one of those recipes that you can just use what you have or what you get on sale. This recipe is also easy to make gluten free if you use gluten free soy sauce. So not only is it quick and easy, it can be quick, easy, and gluten free. If you are looking for a quick and easy lunch or dinner give this one a try! Electric Skillet- I like to use my electric skillet for recipes like this. In a bowl combine jam, cornstarch, ginger, dry mustard, garlic powder, soy sauce, and vinegar. Mix together well and set aside. In a pan cook ground pork until browned and done. Add in sauce and cook over medium low heat for 2-3 minutes or until sauce starts to thicken slightly. Add coleslaw mix and cook for several minutes or until coleslaw is slightly tender. Or until cooked to desired texture. We like this slightly crisp, but you can cook it longer if you like. 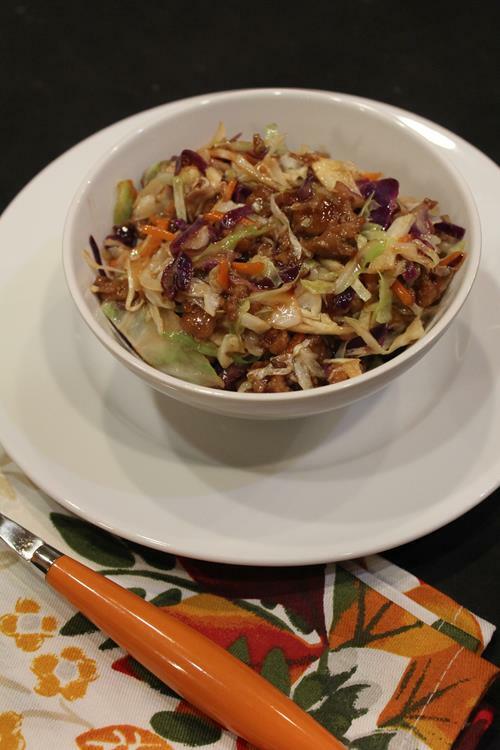 I love using coleslaw mix for different dishes that require cabbage. It is so cheap and convenient.